The dentist can be a scary place for anyone. Especially for a child with anxiety. 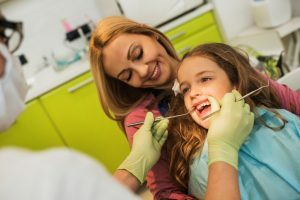 Some children enjoy going to the dentist office but for others it can truly be a terrifying thing that can cause actual physical responses and emotions. As a parent it is important for you to know that dental anxiety is very common and is nothing to be ashamed of. Your child’s dental health is very important and their experience can impact the rest of their life. It can be hard as their parent to know what to do, but it is important to remember that pushing a stressed child to go to the dentist is not the best solution and will only make it worse. Here are some ideas that may help ease the burden of dental anxiety for you and your child experiencing it. Fear of the unknown can be one of the main reasons children feel so anxious about dental visits. The younger kids are when they have their first dental appointment, the calmer they usually are in the future. Getting a regular checkup schedule planned out is an excellent idea so they will know what to expect and be more at peace for their future cleanings. Spending some quality time with your child and role playing scenarios that may take place at the dentist can help them to look at it as a fun and exciting experience. Also finding dental storybooks to read together is a wonderful way to prepare your child. Through colorful pictures and language that is easy for them to understand and having the main character go through a happy dental experience can also set their minds at ease about their upcoming visit. Talk to your child about an upcoming dental visit. Telling them last minute will only make anxiety worse. Often telling them a little bit in advance will help you and them prepare together. However each child is different and it’s important to do what you feel is best for them. Talking to them about dental hygiene and making sure they brush their teeth on a regular basis is also a good way for them to be more comfortable in a dentist office environment. Brushing and flossing with them is a good way to lead by example. It is important to find a friendly dental environment to take your children to, especially those little ones who have some anxiety about it. Hines Little Smiles is the place to go. With our friendly staff and vibrant office we are here waiting with our own smiles to help make your child’s dental visit a pleasant one and a place you will want to come back to over and over again. Contact us if you have any questions or request an appointment online!